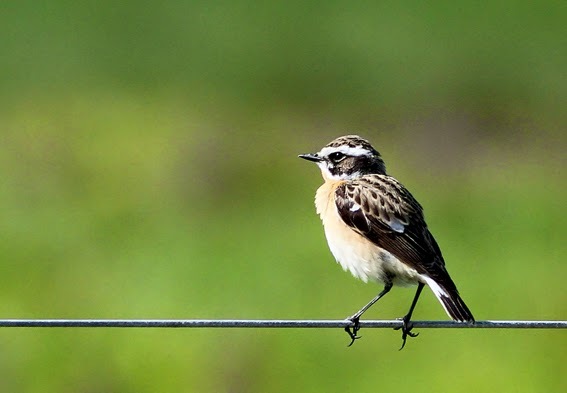 Whilst I was selecting and editing loads of photos to be added to posts, I posted a flight shot of a Whinchat I was quite pleased with on Twitter (and a few other sites) and was chuffed to have the photo favourited 65 times (so far) and several lovely comments, so thanks everyone, much appreciated. The picture was taken on the 23rd April and is on the following link. Still lots more to add to that post yet! Including Connor's Account and fabulous pictures of the Alpine Accentor! • News from Holme NOA HERE. • Wood Warbler Male singing at Deacons Lane, Ely, Cambs. Chris Packham on BBC Breakfast News! I was so tired this evening, I was extremely pleased to find that I didn't have to go racing off after work to see any rare birds! I will be adding all my recent pictures to posts tomorrow night, unless of course there are birds to see! Chris Packham: "Malta is a Bird Hell"
"The BBC presenter talks of confrontations with hunters and police while making films to highlight the cruelty of the annual bird shoot." Britain's Fifth Cretzschmar's Bunting, seen only by a few observers! 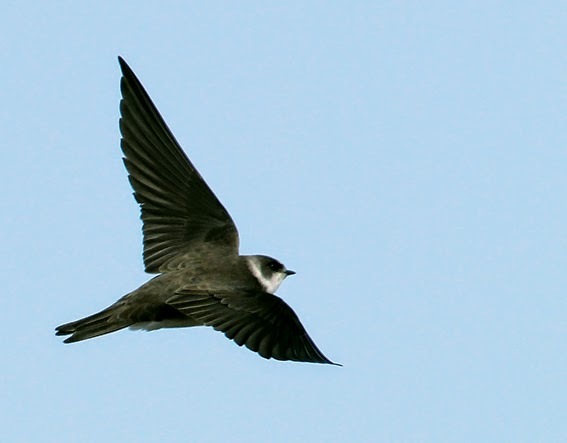 Previous records were 1967, 1979 on Fair Isle and on Orkney 1998 and 2008. Holme Hits the Headlines Again with LITTLE BUNTING added to the Weekend List! I arrived early at Holme and parked up on the NOA carpark, to be greeted by Grasshopper Warblers reeling. It was cold, really cold first thing this morning. I felt completely wrecked, with late blogging last night, editing pictures and then forcing myself to get out early this morning – my body felt like I had walked Blakeney Point there and back on shingle! Although cold, it was a beautiful, sunny day and later on, it got quite hot! I had to return to Holme this morning, just in case the Alpine Accentor fancied dropping into one of the mist nets! Sophie had to pack up the nets shortly after Connor's mega find yesterday, to be able to manage all the twitchers and birders, that were then expected to turn up (which didn't quite happen). So, knowing that Sophie would have the mist nets up early this morning – well, I just had to be here! 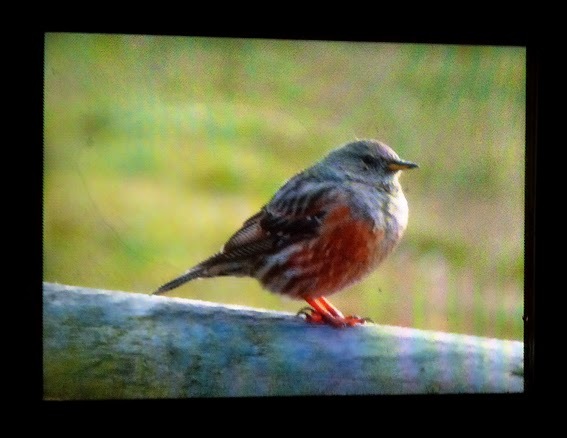 It would have been heartbreaking to hear 'MEGA Alpine Accentor ringed at HBO, will be released at......' on the pager, if you were not at Holme!!! A few other people had the same idea today. Holme Beach opposite the NWT Firs. There was a nice chorus of birds in the NOA carpark, besides the Grasshopper Warblers, I could hear Sedge, Reed Warblers, Whitethroats, Chiffchaffs and a Cuckoo calling. A Grey Heron was on the Broad Water and a Marsh Harrier was flying over Holme marsh. I walked up to the observatory where Sophie and Trevor G. were busy doing net rounds. They had caught the first Garden Warbler of the year, Lesser Whitethroat, Willow Warbler and so on. 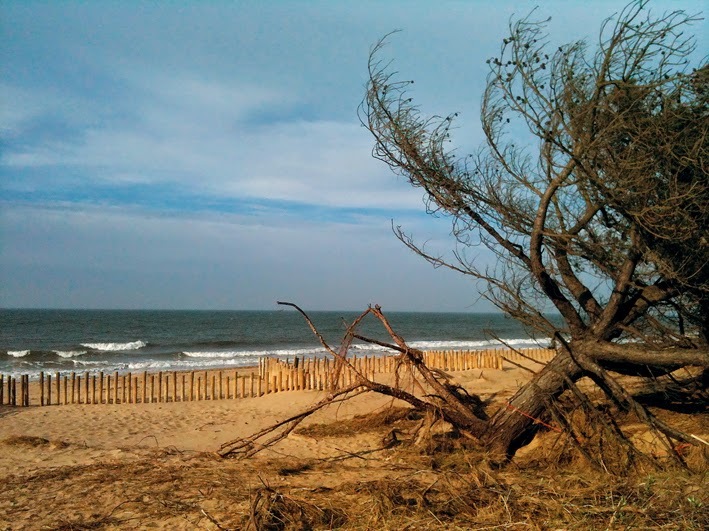 I decided to walk the sueda area and dune ridge (what's left of it), which is east of Thornham Bank. This area of sueda is like a mini Blakeney Point! I flushed two Red-legged Partridges just below Thornham Bank. Birds seen in the sueda were: Meadow Pipits, Linnets, Reed Buntings and flushed one Grey Partridge, but nothing else exciting. It was getting hot now and I really wished I had less layers on! Trudged back through the dunes, more Meadow Pipits appeared and back onto the coastal footpath. 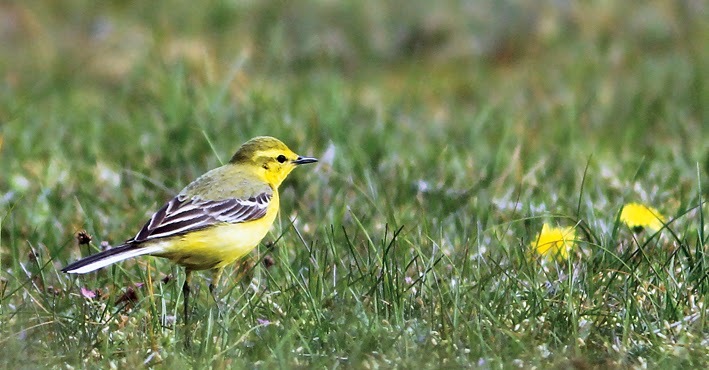 Yellow Wagtails at Holme Bird Observatory. Back at the observatory, we all watched 18+ Barnacle Geese fly west and a Cuckoo flew over. 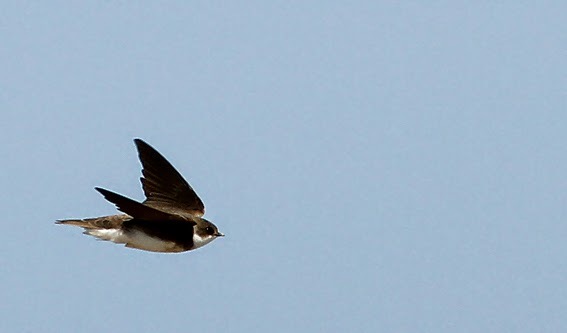 Several Swallows flying through, along with a couple of Sand Martins and also House Martins. 3 Common Buzzards and a Marsh Harrier were spiralling, distantly in the blue skies and a Sparrowhawk zoomed through. 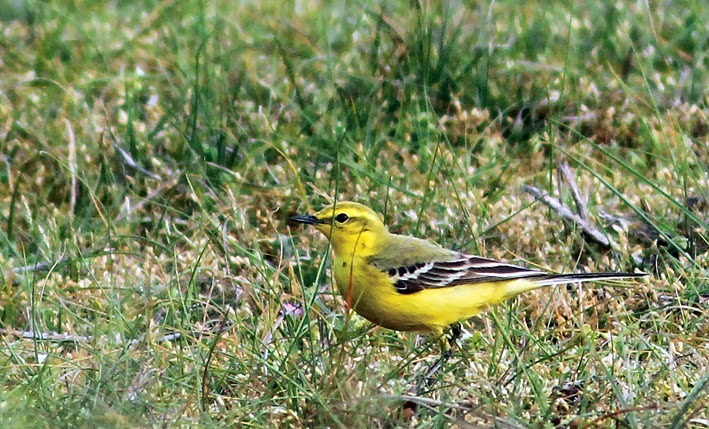 Birds of the day were 3 beautiful Yellow Wagtails that flew over our heads and landed to feed on the short turfed slope, next to the observatory. I spent a while creeping up on them to get pictures – however after reeling off lots of shots, I discovered my camera was set on the 1.5m button instead of 3m (1.5m setting for close-up/macro) – not a happy bunny! A few shots later on the correct setting, something overhead startled the wagtails and off they went, bounding over Holme marsh. Oh well! 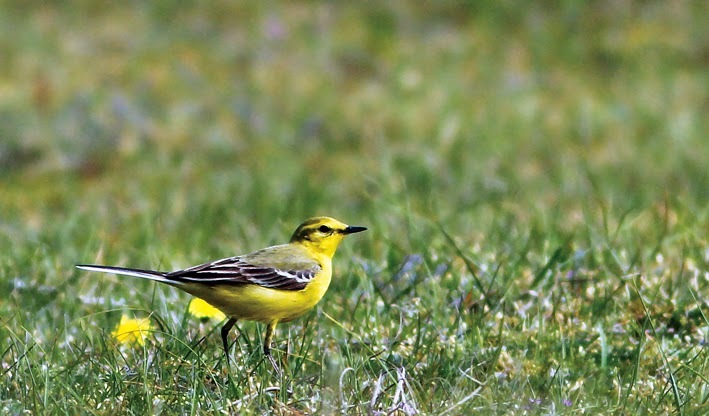 They were beautiful to watch, you can never see too many Yellow Wagtails. I walked round the back of the pines and crept round all the little paths hoping for something exciting, but nothing. Back at the NOA carpark, it was time to change into lighter trousers. Had a chat with Gary H. who was shocked at the lack of people that turned up yesterday and even more so that most people had left by early afternoon (as was I!). Met a very nice, new lady working behind the counter in the NWT visitor centre, who has excellent people skills – quite rare nowadays I find. Back at my car, it was time for lunch. Sat on my picnic blanket in the now gloriously hot sunshine. Got my pillows out and decided I needed a long snooze. It was wonderfully relaxing – listening to grasshopper warblers reeling as I snoozed. I had my pager in my hand – I wasn't going to miss anything..... ! Suddenly on the pager...... 'NORFOLK, LITTLE BUNTING, Holme Dunes NWT, c400yds west of The Firs, just north of access track at 2.29pm' – OMG!!! I was there.... it was round the corner from me! How lucky was that! Chucked stuff in car, locked car, grappled to put rucksack and camera on. Started walking, study pager again – hmmmm..... for some bizarre reason I read that it was probably in The Forestry, so I crossed the road and headed for there. 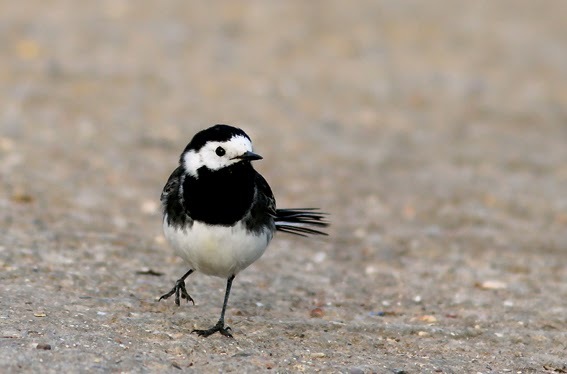 Another birder who came walking fast past me at the carpark, decided to walk along the road – he wasn't sure and neither was I. Tried to phone Holme NWT for advice on exact location in case they knew, but no reply. Phoned a couple of people to find out that the finder was David Bradnum and that it was along the Firs Road. Suddenly I could see where I should be, speedily made my way across the Forestry to join a few others including David standing on the road. They informed me that I had just, JUST missed it. The birder who walked along the road, had just seen it! Hmmm...... well, you only have yourself to blame Penelope! The Little Bunting was only watched for a matter of minutes, first being seen on a small bush near the side of the road, then flew across the road into a bramble area and then continued across the marsh, as if towards the path that runs along the NWT Wader Pools. I walked back to the carpark and walked the path to the wader pools with another birder, hoping and praying the Little Bunting would appear on the path before me – no, nothing, nothing at all. Walked back along the path, several more birders had turned up now on the road, including Julian B, Mike S., Connor and Billy Rand and several local birders – all of us disappointed. 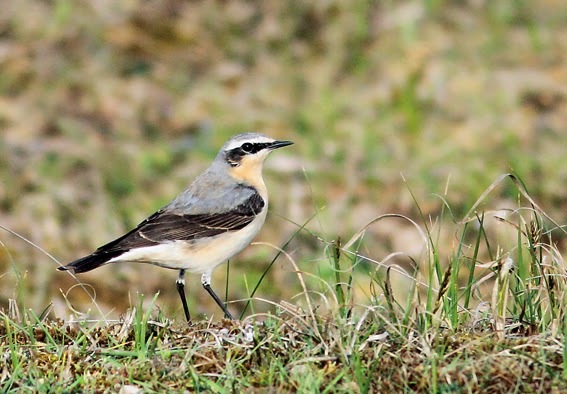 Wheatear in the The Forestry, Holme Dunes NWT. 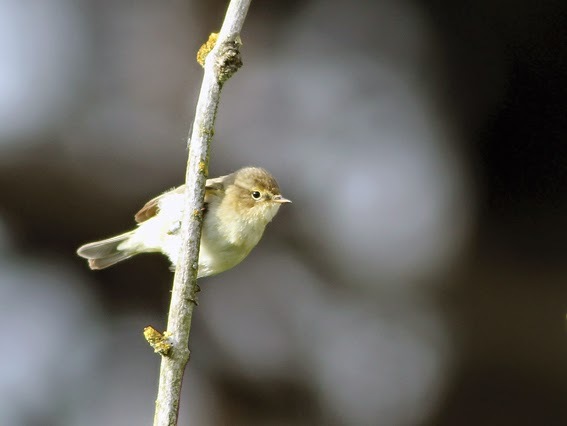 Chiffchaff from the Dell Hide, Holme NOA. I wasn't going to waste time looking for this bird – spent enough time doing that yesterday! So off I went to the NWT Forestry again to look for my own good bird. In the short turfed area I sat and watched the same (they looked like the same ones!) 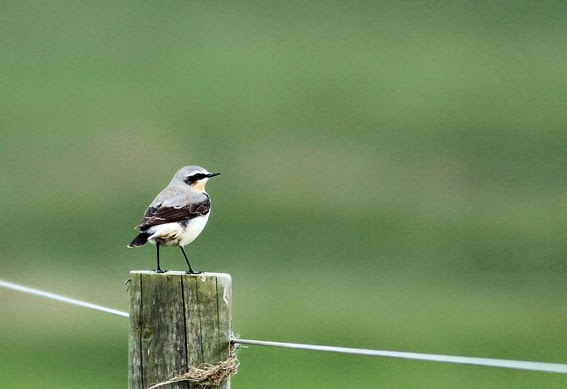 Male and Female Wheatears as I saw yesterday and a few Linnets. A Cuckoo was also calling, but little else was seen. Walked back to my car and nipped in the NWT V.C. to buy a bar of chocolate to console myself. Walked round the observatory again and sat in the Dell Hide watching plump Hedge Sparrows (without orange breasts! ), Chaffinches, a rabbit and a single Chiffchaff. Returned to the carpark via the pines. 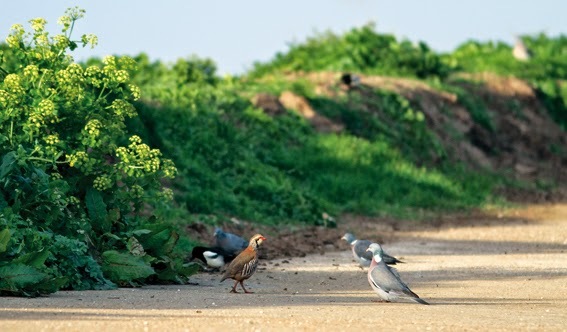 Red-legged Partridge, Magpie, Stock Dove and Wood Pigeons at Choseley Barns. 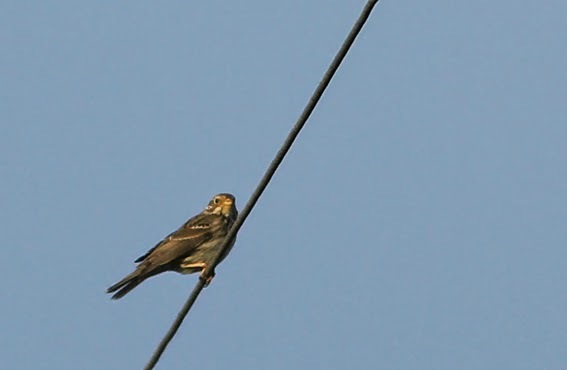 Corn Bunting at Choseley Barns. 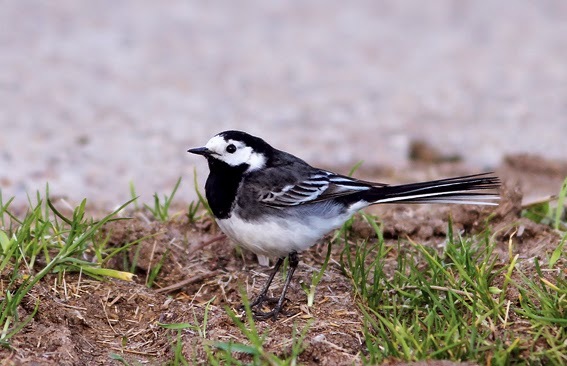 Pied Wagtail at Choseley Barns. 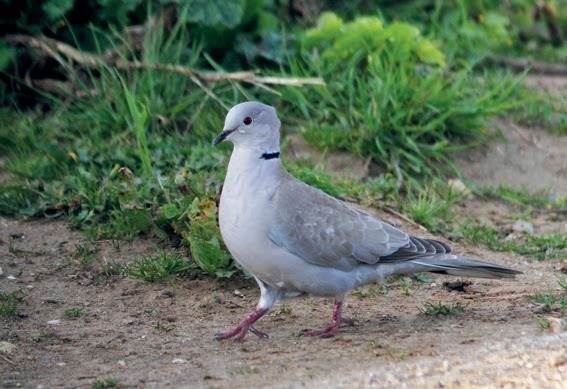 Collared Dove at Choseley Barns. I had had it now, enough was enough on so little sleep. I decided to end the day lazily and drove up to Choseley Barns and sat in the car watching birds feeding on the concrete pad. This turned out to be the highlight of the day and although I didn't see the hoped for recent Turtle Dove, I had a massive selection of birds here and some unusual ones too! Birds that came down to feed were: Collared Dove, 3 Wood Pigeons, Stock Dove, 2 Magpies, 2 Red-legged Partridges, 2 Grey Partridges, 2 Oystercatchers!, 2 Magpies, 3 Corn Buntings, 4 Yellowhammers, Pied Wagtail, Goldfinches, 3 Pheasants, 2 Mallards, 2 Hedge Sparrows, Blackbird and 2 Chaffinches!!! Birds seen flying over: Swallows and a Sparrowhawk. 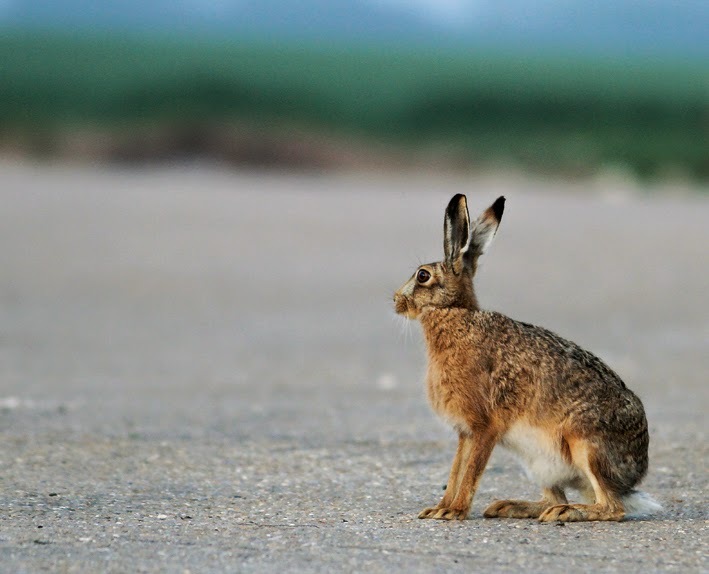 A Hare appeared, only yards in front of me, just before I left at 8pm. I hadn't intended in staying here so long, but the variety of birds that kept appearing was intriguing. 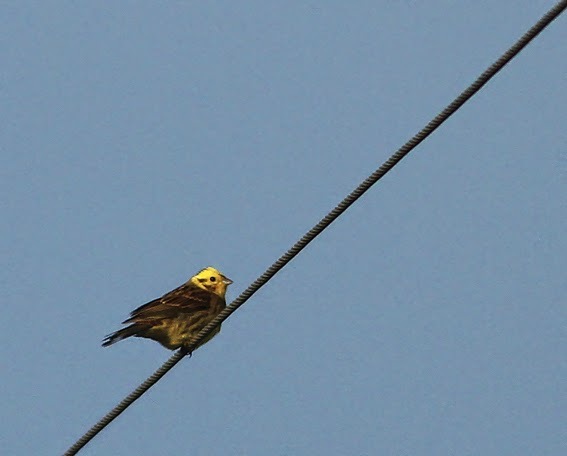 I had heard from another birder recently, that the reason the hedge had been ripped out (that the Corn Buntings and Yellowhammers used to sit on) is because the son of the farmer who has now taken over the farm (apparently) was fed-up with all the birders, so ripped it out! I just think that is so very sad. Unfortunately though, a hedge being ripped out is not going to stop us going there! This can't change either, as the official coastal footpath runs alongside the concrete area. In fact the hedge being ripped out, means that there are more birds to see on the ground now! Hare at dusk, Choseley Barns. 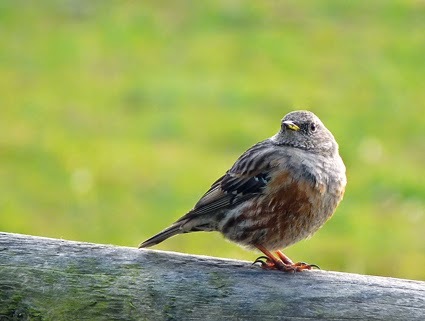 SEE THE ALPINE ACCENTOR POST BELOW, TWO OF CONNOR'S PICTURES ADDED! STOP PRESS! MEGA! 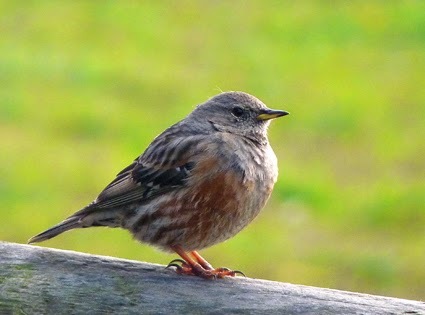 ALPINE ACCENTOR FOUND AT HOLME BIRD OBSERVATORY & THE BIG SEARCH!!! Picture taken from back of Connor's camera! 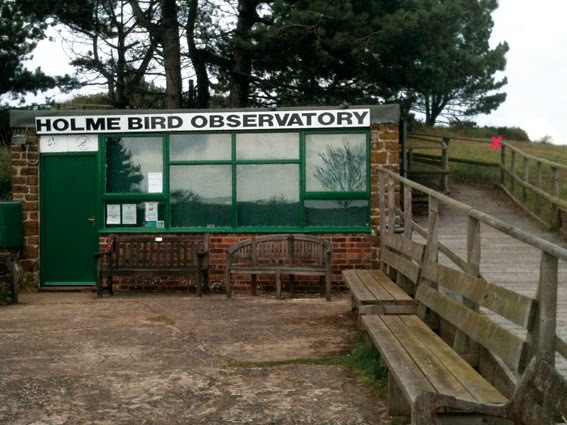 HOLME BIRD OBSERVATORY — First for Holme and Third for Norfolk! The X on the picture below is where Connor photographed this mega bird – incredible!!! I have seen Connor's pictures and they are stonking – I don't know how he managed to keep the camera still! I think he was too tired to add them to the net tonight!!! They will follow tomorrow!!! Connor has very kindly allowed me to add a couple of his pictures to my blog, which is much appreciated, thank you! Where do I begin!!! Well, I was going to Choseley this morning, to see if yesterday's Turtle Dove was still there. Yet again, I was not up early! When the pager Mega'd ALPINE ACCENTOR at Holme I had had no breakfast and none of my gear was in the car. I flew downstairs and ran in and out of the house putting gear in boot and drove at Penelope Pitstop speed to Holme! I seriously can't remember what time I got there, but I was the third car in the NOA carpark! By this time I had had a phone call from Connor on route to tell me he had found it! I won't go into Connor's full account of his find, that's for him to tell, but basically he found the Alpine Accentor early morning AND managed to photograph it! I just can't believe he saw it on the bl**dy rail next to the observatory, how jammy was that! I feel really sorry for Sophie though, who was putting mist nets up at the time. Connor was the only observer. Connor presumed the bird would be seen again throughout the day, but sadly this was not to be for all the other birders who turned up and continued to turn up throughout the day. I will keep this fairly brief as its very late and I am exhausted, but I spent the rest of the day at Holme searching for that bird. It was raining on/off for the most of the morning, but brightened up mid to late afternoon and the evening turned out to be the most beautiful part of the day. Lots of birders turning up, who I won't list, as it will take too long, but I think most of the Cley birding fraternity were there! I did muse to myself that if James MacCallum found something on Blakeney Point there were be a big race back to Cley!!! 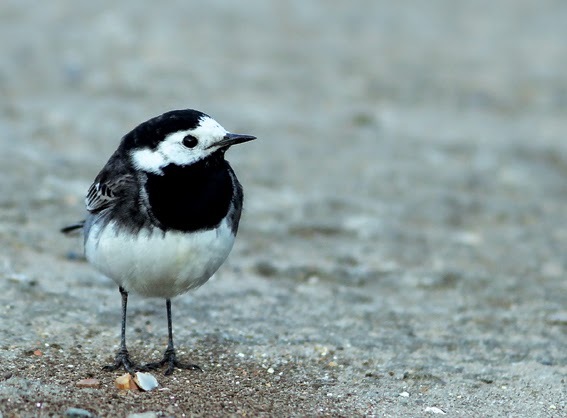 Connor and I walked round the back of the pines and along the beach searching for this bird. Through tons of phonecalls and texts, Connor's phone had run out of battery, but luckily I had my iphone lead with me, so Connor was in luck (again this morning)! We drove to the end of the Firs Road and parked by the toilet block. We walked west through the golfcourse and as far at the beach chalets at Old Hunstanton and back. On route we had an incredible selection of birds – at least 20+ Wheatears in the low valley area – there were so many we had a job to count them all! 1 Ring Ouzel was also seen in a bush and flying off, a huge flock of 35 Yellow Wagtails flew overhead, several Linnets were seen and Whitethroats and Lesser Whitethroats were heard. 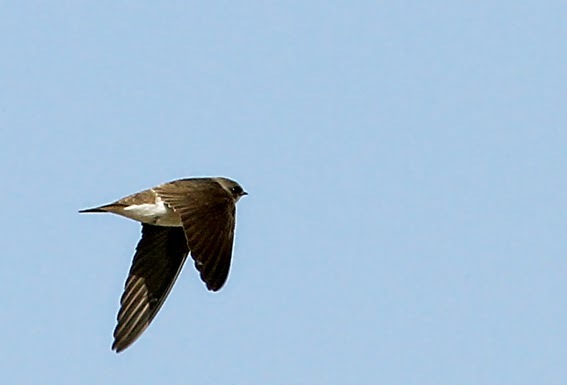 Several Swallows flying through. 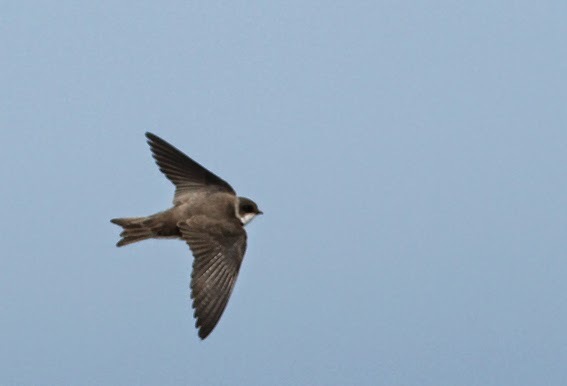 Back at the car we had a Swift go over our heads, (my second this year) and a Cuckoo was calling. News of 4 Dotterel at Choseley cleared most birders out! Both Richard 'The Hat' and I couldn't believe so many people had left so early. Ok the bird may well have moved on straight away, but no one knows that for sure. I walked to so many areas, I can't remember what order and when I did them in now and I'm very tired as I write this. 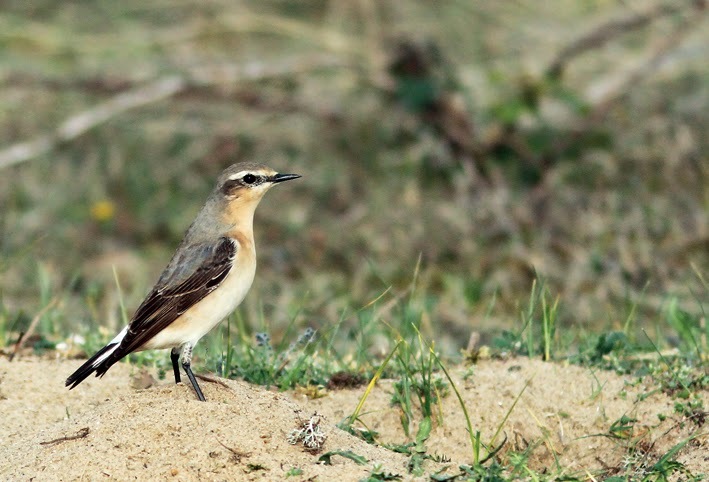 Wheatears at The Forestry, Holme Dunes NWT. Back at the NOA carpark there were two Grasshopper Warblers reeling and a Sedge Warbler was singing. Connor went back to the observatory. I sat in the car having a coffee while the rain was falling heavily – good move! I continued searching, covering the NWT Forestry where I saw 5 Wheatears, a Kestrel and a Marsh Harrier over Holme marsh. 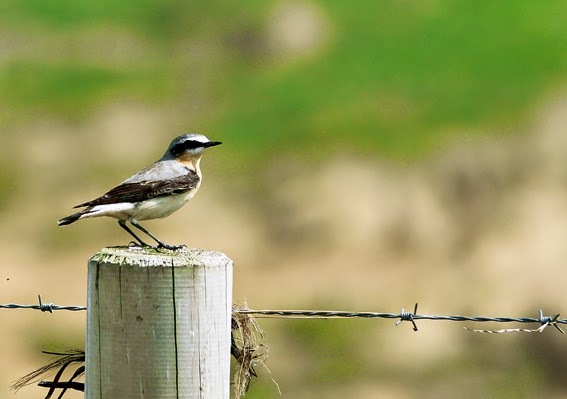 There were another 3 Wheatears in the Horse Paddocks along the Firs Road. I spent time sitting in the Dell Hide that overlooks the pond next to the observatory three times today, as this is sheltered and has had some good birds here over the years – hedgesparrows appearing from the undergrowth, got the heart racing! By early evening I was the only birder left! It was a beautiful evening with full sunshine. 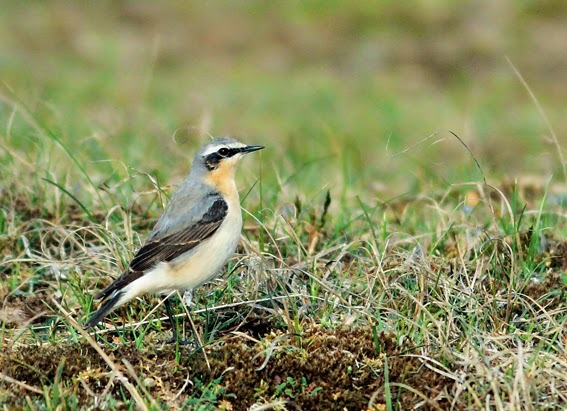 There were 4 wheatears sitting out on Holme marsh. It would have been pretty awesome if that bird had appeared when I was the only one left! I walked round the observatory again and along the top board walk towards Thornham, back again and around the pines and beach, then crossed over to the carpark. Left and parked at the 5-bar gate and walked all along the back of the bungalows and Saltings. At least 6 Whitethroats were heard and seen, 6 Red-legged Partridges and three birds 'in off' the sea birds, which were a single Collared Dove, a Snipe and a Gadwall!!! Several Cuckoos bombing about too and calling. I went back again to the observatory for a final look round and finally gave in at 7.45pm. Went to my parent's. Showed mother Connor's picture on the back of my camera, she was really pleased for him. Went to the supermarket in Hunstanton for mother, grabbed chips and back to Holme again. Eventually arriving home at around 10.15pm! Phew! Looks like a good weekend for birds – south easterlies and rain, dawn 'til dusk birding coming up!!! 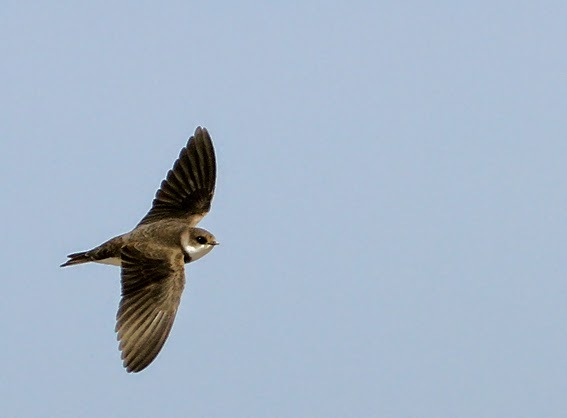 I was going to search through and select my Sand Martin and Whinchat pictures this evening, but after spending so much time on twitter (see post below) I have run out of time! URGENT – TWEET NOW PLEASE! You have until 8pm tonight to join in Chris Packham's tweet storm on hashtag ‪#‎MaltaMassacre‬ to help stop the massacre of thousands of birds in Malta, currently happening right now! Second top trending hashtag on twitter currently by 8pm. KEEP TWEETING, WE HAVE UNTIL 8PM. KEEP THE TWEETS AND RE-TWEETS GOING PLEASE! LETS MAKE A DIFFERENCE! 26.1k tweets so far this evening! Well done everyone!!! Huge thanks to everyone that took the time to tweet. I have never tweeted or re-tweeted so many times on my entire time on Twitter as I have in the last 2 hours! TURTLE DOVE at Choseley Barnes. I almost wanted to put this in the mega news section! Salthouse & Cley – A Spectacular Day! 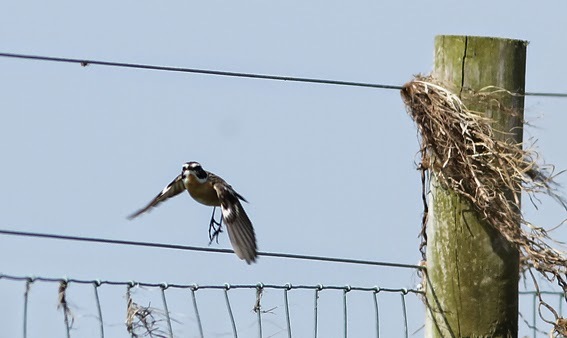 Catching flies at Gramborough Hill, Salthouse. 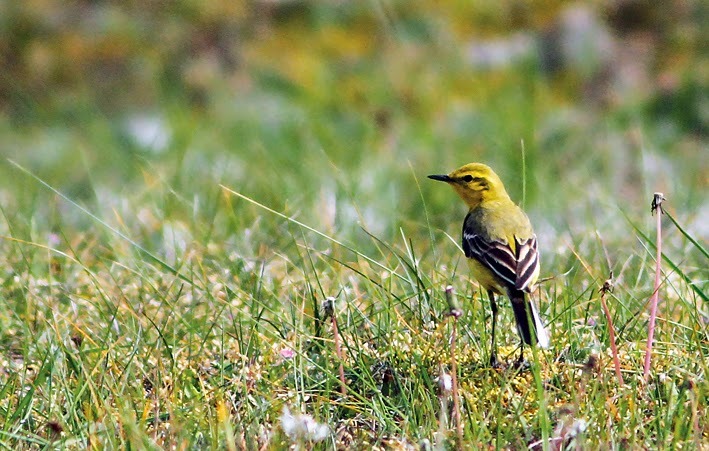 A spectacular day with glorious sunshine and light SE winds – perfect for migrants. My plan was to start at Gramborough Hill, Salthouse and work my way west along the coast. I wasn't planning any long walks today, as my body ached badly from the Blakeney Point walk yesterday! I arrived in Cley and stopped briefly in Old Woman's Lane to witness 4 Common Buzzards spiralling in the thermals at 9.45am. A hare ran through the field. Chaffinches and also a couple of Swallows were on the telegraph wires along the road. Had a nice birdy catch up with R.M before I continued down the road. 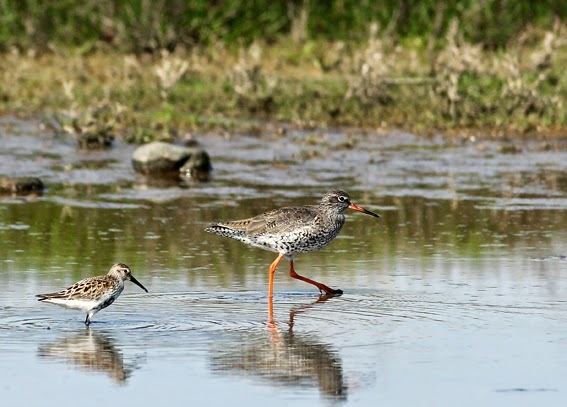 Dunlin and Redshank at Gramborough Hill, Salthouse. 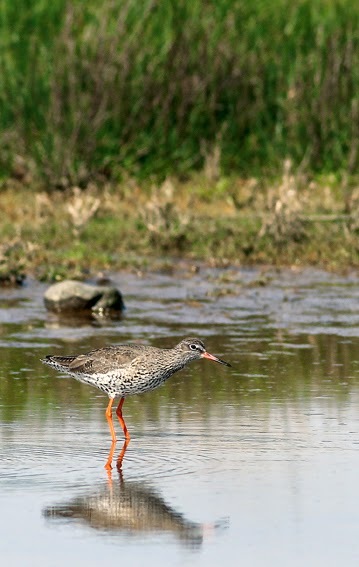 Redshank at Gramborough Hill, Salthouse. 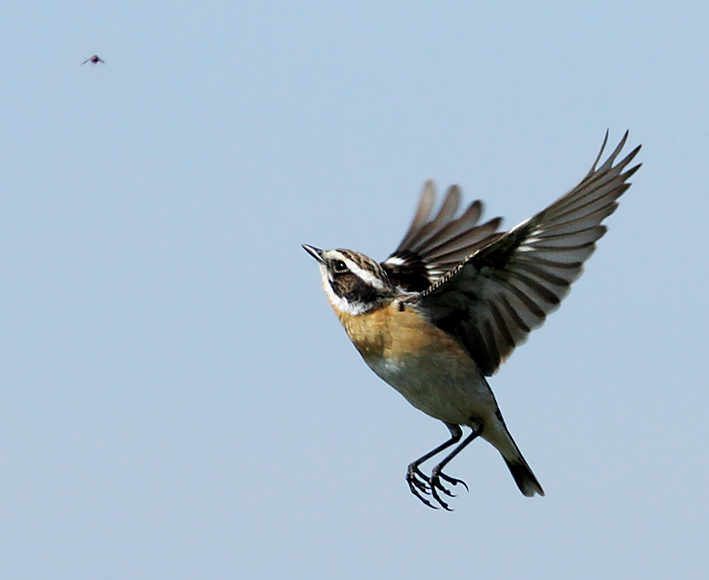 Whinchat at Gramborough Hill, Salthouse. I parked up at Beach Road, Salthouse and walked to Gramborough Hill. 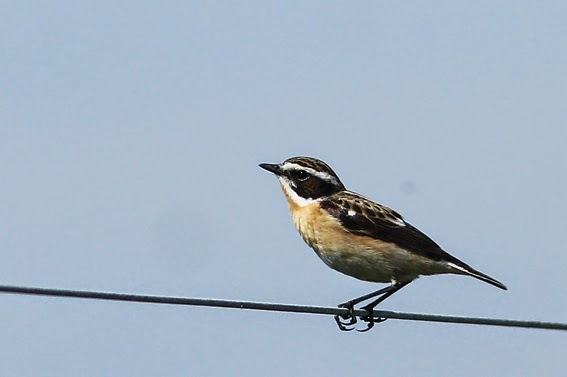 On arrival I bumped into Carl Chapman and two other birders, who had seen a good selection of birds including 2 Whinchats, a Redstart, the Richard's Pipit, Yellow Wagtails, 9 Common Buzzards, Wheatears etc. 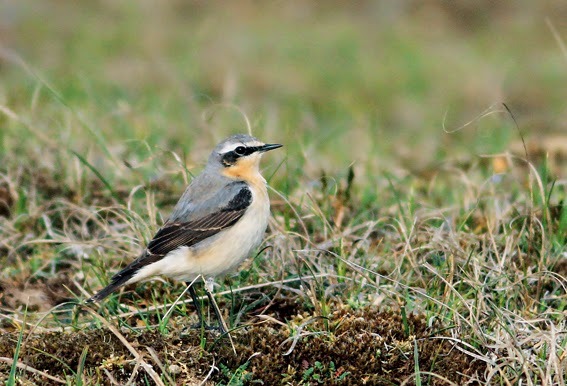 There were at least 10+ smart Wheatears in the field alongside the fence, that runs towards Gramborough Hill. 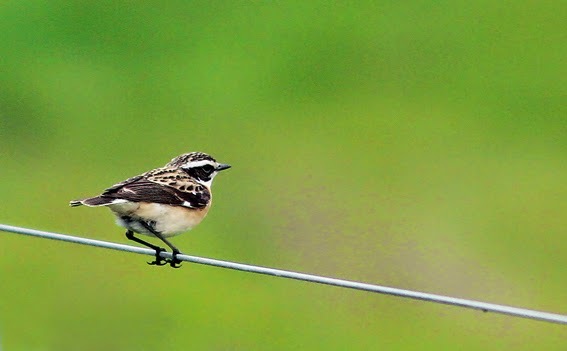 I had incredibly close views of one of the very smart Whinchats sitting on the fence wire and luckily got some decent pictures. 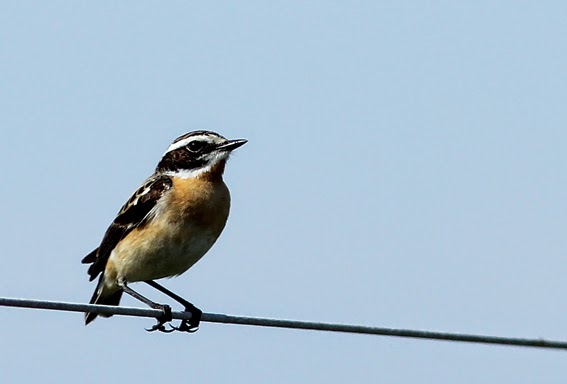 The Whinchat seemed to have a favoured area, so I sat in the grass and waited patiently – this certainly paid off and got lots more pictures! It felt like a summer's day and felt magical to be here. There was a Dunlin and Redshank in the shallow pool and 2 Avocets also flew over my head. With much searching, I couldn't find the Redstart anywhere (bit like yesterday). There were also several Reed Buntings, Meadow Pipits, Hedge Sparrows and more Wheatears. 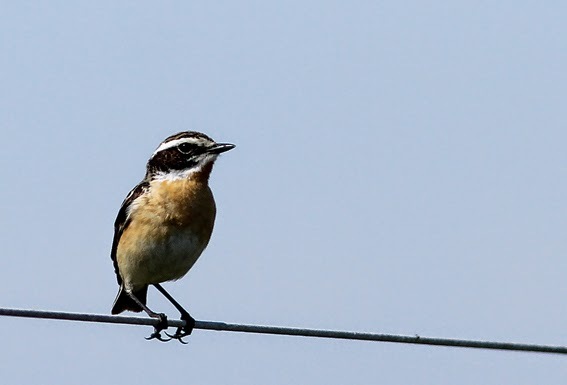 I climbed to the top of the hill as several birders were turning up to see the Whinchats and Redstart. The scene before me, when I stood by the sandy cliff edge overlooking the sea was something else! There was a huge hirundine movement going on, I can't recall the last time I saw such numbers as I witnessed today! 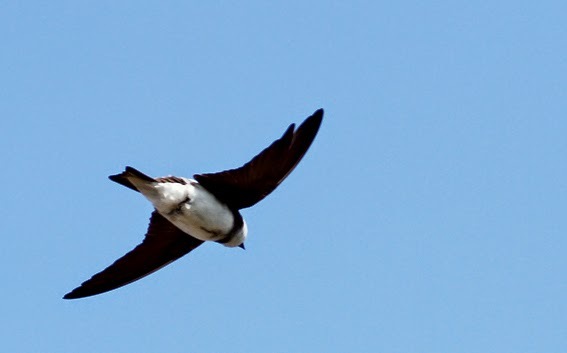 There were simply hundreds of Sand Martins skimming past – I just stood there in wonderment and smiled – it was magical. 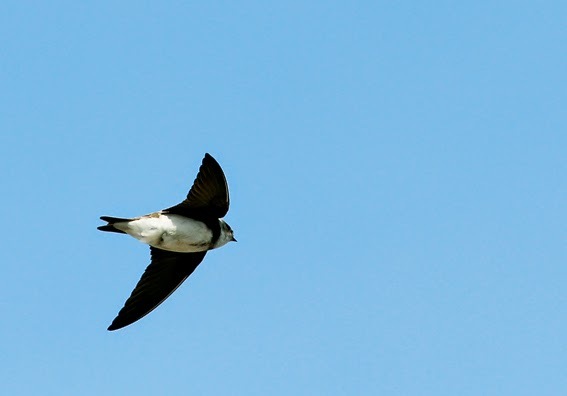 The Sand Martins were flying past me at eye level, twisting up into the sky, out to sea and back again – this was the highlight of my day. I also spent a long time photographing these beautiful birds. Hopefully I will have one or two decent shots, when I go through the pictures. I sat here soaking up the sun and the scenery for a long time. Nice to bump into Pete from Norwich today and also met several blog readers – nice to meet you all. I eventually tore myself away and walked back to my car for lunch. 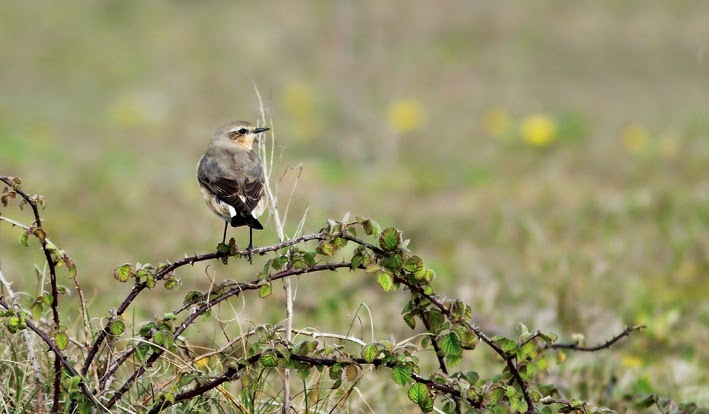 Wheatear at Gramborough Hill, Salthouse. 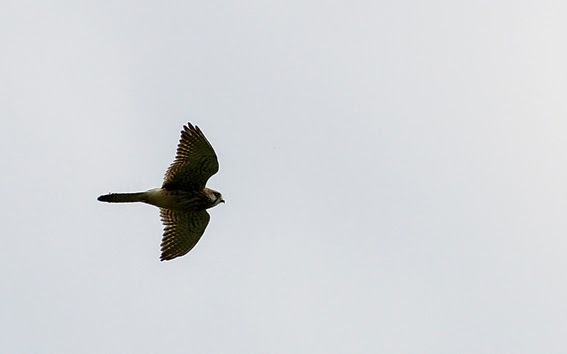 Kestrel over Gramborough Hill, Salthouse. 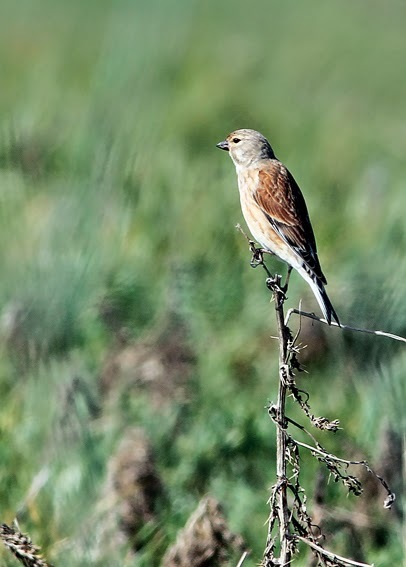 Linnet at Gramborough Hill, Salthouse. 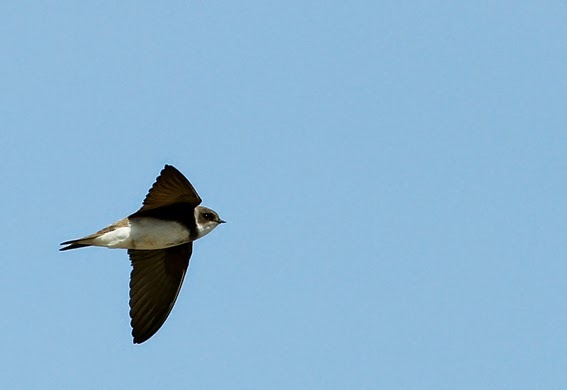 SAND MARTINS AT GRAMBOROUGH HILL, SALTHOUSE. 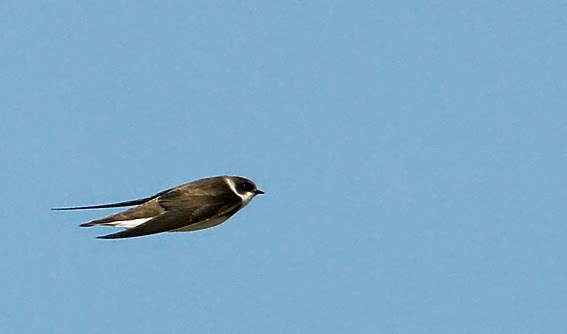 Sand Martins skimming over Gramborough Hill, Salthouse. 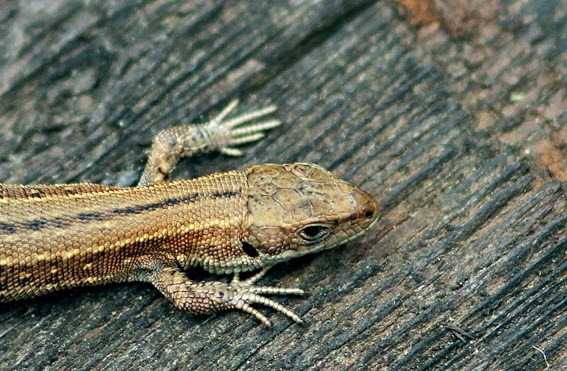 Went to Walsey Hills NOA and had a lovely surprise – not only was an adult Common Lizard on show at the top of the steps, there were also some very tiny baby lizards sunbathing too – so cute! Willow Warbler singing, Chiffchaff, but little else found. Met Terry, a volunteer who told me he has been volunteering at Walsey Hills every Wednesday for the past four years – which I didn't know! 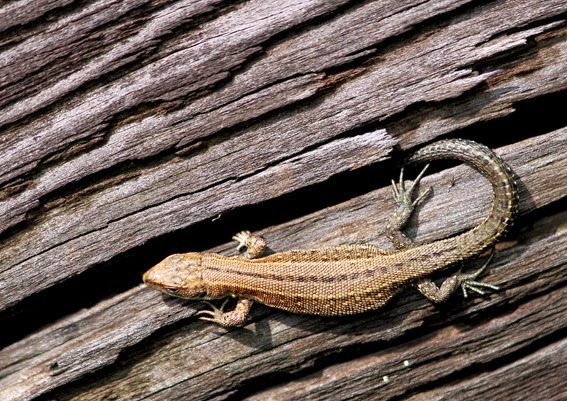 Common Lizard at Walsey Hills NOA. Walked to Gramborough Hill again. 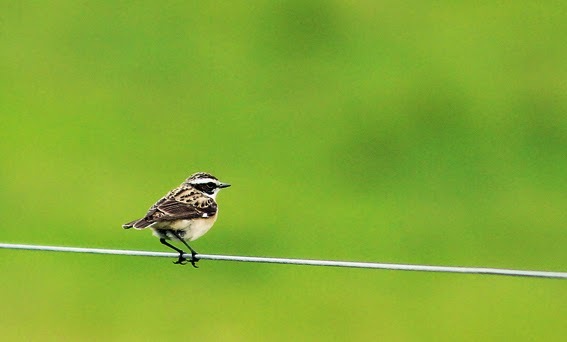 The Whinchat was still on the fence wire and there were still good numbers of Wheatears in the field. Several other birders here this evening including R.M., M.A.G., Pete S., Julian B. and another local birder Steve. 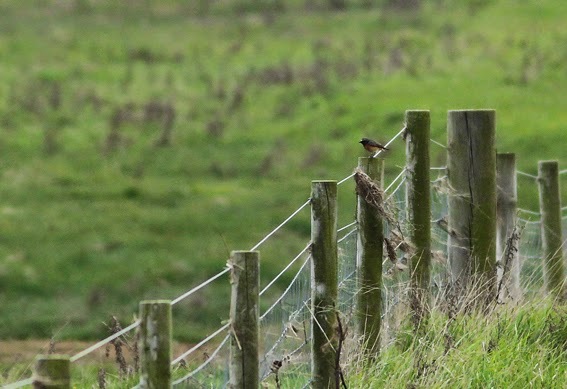 I got a couple of glimpses of the Redstart with Richard and Mark and then later on with Julian and Pete, where I watched and photographed it distantly perched on a fence wire before disappearing (below). The sun had gone in and it was pretty cold now. Walked back to my car and left. Common Redstart at Gramborough Hill, Salthouse. 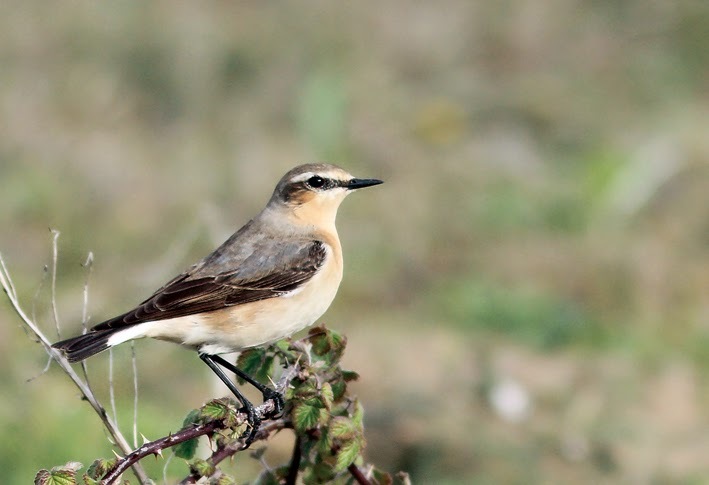 Wheatear at Gramborough Hill, Salthouse this evening. I drove to a particular spot to listen out for Nightingale singing, but no luck. I was then going to go home as it was getting late, but I decided to go to the Sewage Works Road in Cley, just to see if I could hear Nightingale here. Bumped into Andy J. and a couple of other birders. I am so glad I did, as I had a whole list of birds here: Cuckoo calling, Grasshopper Warbler reeling, Cetti's Warbler, Lesser Whitethroat, Common Whitethroat and a Nightingale all singing! Barn Owl hunting over the meadow and 2 Noctule Bats were seen! I also heard a bird burbling/trilling in two bursts, close to the sewage work gates – I searched very hard to find the owner of the trilling until dark – can someone please check this out in the morning!!! Could be a Bee-eater! Left Cley at 8.45pm! Back to work tomorrow, but the good news is, the weekend will be here soon! Loads of Photos Added & Update! Thursday Update & The Easter Weekend! MEGA!!! 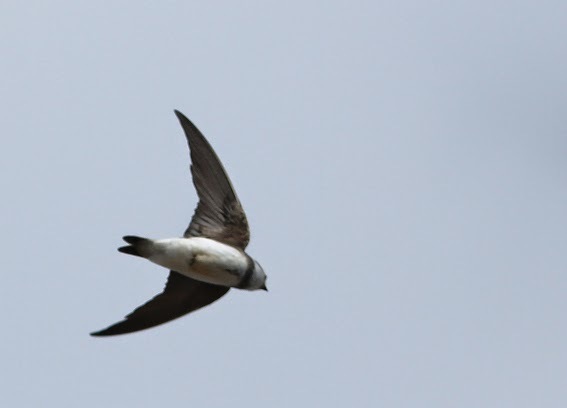 CRAG MARTIN at Flamborough Head! 50+ Harbour Porpoises Off Hemsby This Evening! SPRING HUNTING IN MALTA – THIS MUST STOP!!! Highest Level of Air Pollution Ever Recorded! MEGA! Dusky Thrush in King's Lynn Cemetery!! !